If you follow me on Instagram, you have probably seen that I spent my Christmas in Austria. Christmas has always been a holiday I spent with my family no matter what, but this year due to it being on the weekend, I made a difficult but great decision to travel during those days. I have never been to Austria before so naturally, since I have an incurable travel bug, I was really excited to visit it. However, the best part is that I managed to tick not one but two countries off the list. Since Vienna is so close to Bratislava (the capital of Slovakia), we spent an afternoon there too. It was super foggy and cold, so I barely managed to properly explore the city, but may I just say that it's a HUGE difference from Vienna, although it's only an hour's drive away. I think I have never seen a more beautiful city in Christmas time than Vienna. It was truly breathtaking, the architecture and the Christmasy decorations were incredible. I also really enjoyed their Christmas market, as it's quite different to the markets I visited here in Germany. Overall, Vienna is a city that really left a big impression on me, and I hope to come back there someday when the weather is warmer. I am not even going to start about their cakes and restaurants because I would need another separate paragraph just for that, so instead I will let the photos speak for themselves. 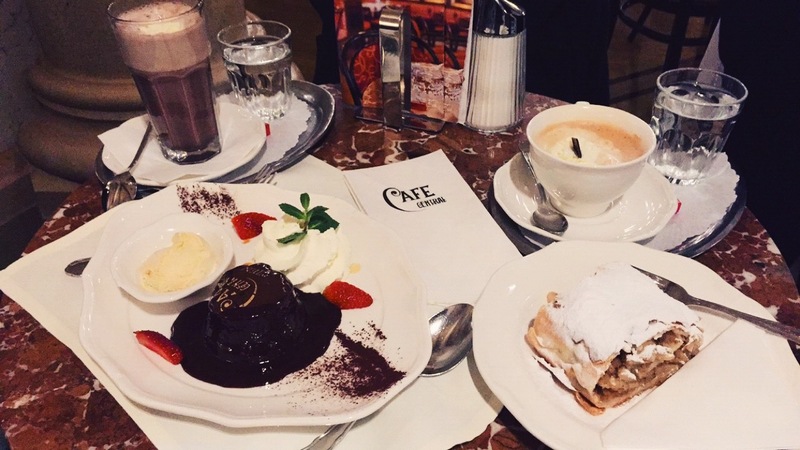 Let me know if you've been to Vienna before and what was your favorite part about it! I already said how much I love your pictures right? haha, this seems such a fun way to spend the holidays!